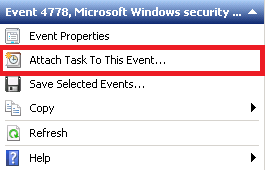 In the Event Viewer I go to the event I wish to attach my task to. 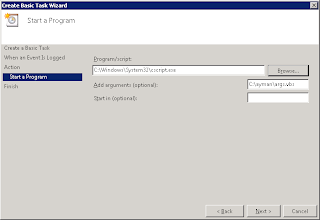 I chose event 4778 which (in Windows 2008 R2) occurs when a user reconnects to an existing session. I am going to pass the Date, Event ID, Computer, Account Name, Accoount Domain, Client Name and Client Address to our script. First we need to create the task. 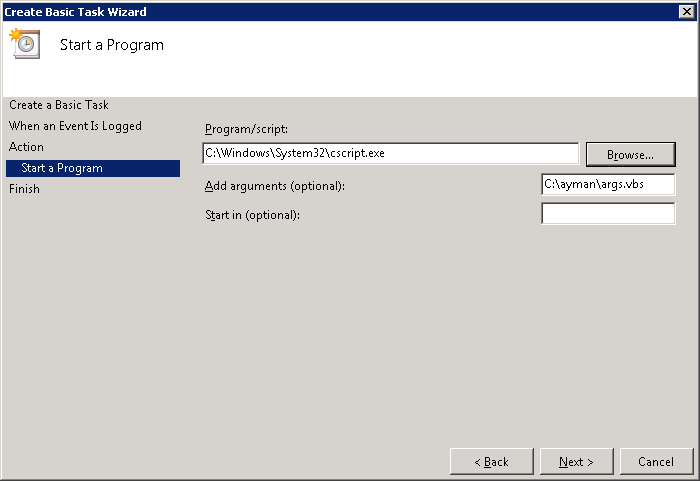 Continue the Wizard and choose for Action "Start a program"
Now to extract the event details and pass them to the script we have to modify the xml of the scheduled task, and add xquery path strings to the details we want to extract. 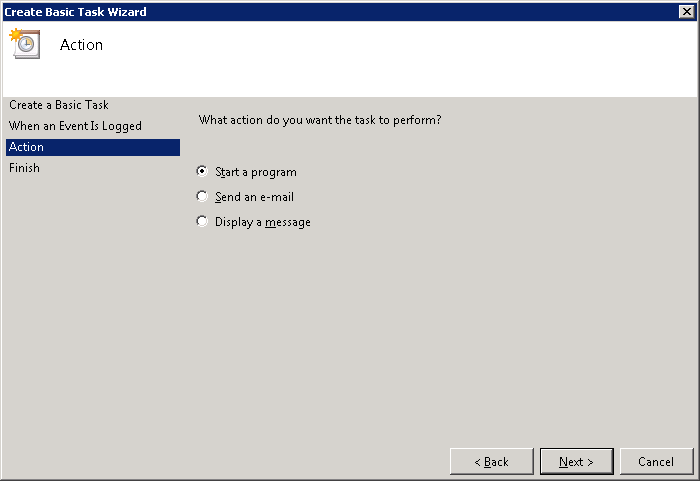 Export the task from the Task Scheduler. 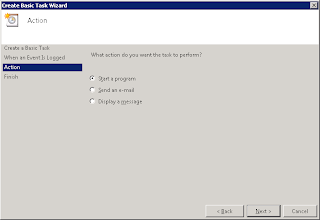 Delete the task created by the wizard earlier and import the xml we edited instead. Finally we need to fire the event, in my case I am going to disconnect and connect back to my remote desktop session. Upon connecting I get the script output. How would I write a ValueQuery fir the IP address? I tried "Event/EventData/Data" and it does not work. Look in the XML view (from details tab) to find the structure of your event, and then you can query the field you want. If there is no specific element for the IP, you will have to parse it yourself inside your script. Thanks for this great tutorial! I'm using this with Windows Server Backup to report to Zabbix if the backup was done well. Thanks! I was happy to find this. Very interesting. My additional question: In a special task I use 2 event-triggers, from both events I want to pass the same label to my script or batch-job. Has the query-section to be put twice into the xml-file? I really enjoyed your article; seeing the example helped a lot. But I've encountered an issue when trying to passing a single character in the event's Event/EventData/Data location. I've set up a "variable" in the ValueQueries section, and reference it in the Actions/Exec/Arguments field of a scheduled task. With test data (none of which was a single character), there was no issue, and the command (a batch file to log the args passed) showed everything was coming thru perfectly. But when real data (a single character (1) ) was in the Data field, the variable replacement doesn't occur, and the "variable" string, "$(EventInfo)", is passed to the batch file, and printed. I've tested with alpha vs. numeric vs. punctuation. Any single character causes the failure, but when the character is doubled, the value comes thru perfectly. I would appreciate any advice, as I have Googled, to no avail. This is really cool. I'm not really down with XML, is this easy to replicate? I'd like a "tornado warning" message! "x Days since last unnatural disaster"
I am facing an issue where I am unable to pass "Event/EventData/Data" as the parameter to one of my programs. The ideal way would be to pass the value in the array of "Data" elements but I am happy to even pass the whole "Data" object or "EventData" object as well. Unfortunately I am unable to even get hold of those elements or their values. My event XML has an Array of 4 Data elements without name attribute to it, sorry couldn't paste the XML file here due to blogspot restrictions. In case you wish to see the XML files then please let me know your email address. I too, have the issue with the event having four values with no name. And only the first one gets passed to the command. I want just the forth parameter (IP Address) from the event logs. But I am only getting LogonDenied (from first parameter. I have tried Event/EventData/Data ... Event/EventData/Data , etc. Dear Ayman, thanks a lot. I wonder why the information is not in the oficcial MS documentation. I'm using performance monitor to write an event and then use that to trigger a task that needs to pass the data from the "countername" variable to the task. I successfully tested this passing the eventid as an argument, but I can't get it to pass the counter. This is the code I'm using to extract the EventID from event viewer. Event/EventData/Data[@Name='EventID']. But when I change EventID to countername, it just passes a null value. Anyone know how to extract this variable from event viewer?